When coming up to a roundabout you must give way to all vehicles that will cross your path from your left. Correct or incorrect? When coming up to a roundabout you must give way to all vehicles that will cross your path from your left. Correct or incorrect? That's right - you give way to vehicles coming from your right. Technically, if someone is using a roundabout incorrectly they might come from your left (and you should avoid hitting them), but this situation would be almost unheard of. It's likely they would be at fault in any incident. 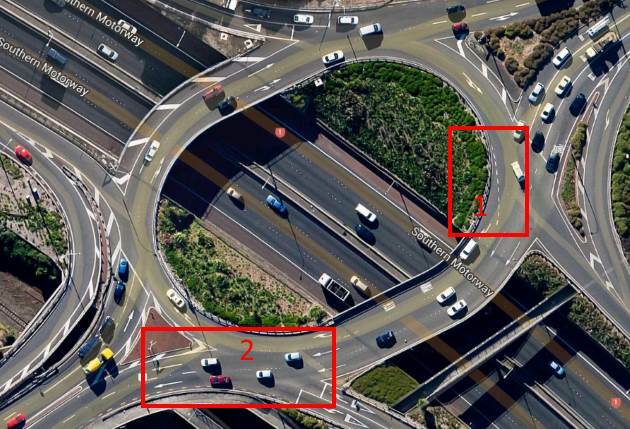 On multi-lane roundabouts it's a little more complex. If there are vehicles in the right lane turning right, or in the right lane going straight ahead and there are two lanes exiting the roundabout and you are turning left, you can go because the vehicles will remain in the right hand lane while you will use the left hand lane. If there is only one exit road off the roundabout, vehicles coming from your right that are going straight ahead will begin signalling left as they pass where you are waiting to enter the roundabout, and then will move over left to exit the roundabout.